The canal at the time of flooding. Work is progressing on a masterplanned development at Reem Island in Abu Dhabi, which includes a park, canal, hotel and mid-market residences. UAE-based Aldar Properties said work is moving at a steady pace in its master-planned community on Reem Island, Abu Dhabi, with a 2.4-km canal now open and construction of the Vida Hotels and Resorts set to start this year. 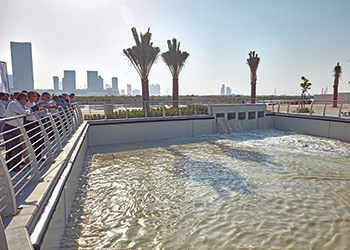 The newly-opened canal is flowing adjacent to 35 plots within Aldar’s master-planned community, bringing waterside views, promenades, seating and areas for exercise and socialising to the island’s steadily growing population as well as visitors from other parts of the city. Also, the beach near the head of the canal is expected to become home to many community events following the success of Aldar’s inaugural Reem Weekend. Reinventing the park experience in Abu Dhabi, Reem Central Park is set to become a focal point when it opens in 2018. The park will feature a mosque with a capacity of 2,000 worshippers set beside a reflective pool, food and beverage (F&B) outlets, a retail centre, a skate park, play areas, and interactive water features. Reem Central Park’s attractions and amenities will also lead to a natural waterfront, including a 4-km-long promenade that will feature edutainment opportunities on the area’s natural reserves and plant life. The Bridges ... sold out. Construction is under way with streetscaping complete and the coastalscape nearing completion, and hard and soft landscaping and infrastructure expected to commence this month (July). 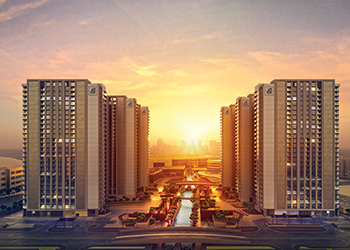 With homes ranging from studios to three-bedroom apartments, The Bridges has been sold out and is expected to set a new benchmark for mid-market homes in the UAE upon completion in early 2020. Meanwhile, Meera is making good progress with the structure now at the 16th floor out of 26. Construction of the Vida Hotels and Resorts project is scheduled to start this year and is due for completion in 2020. Vida will operate a 262-key hotel and 192 serviced apartments. These will be accompanied by Aldar’s 329 marina residences within the development, which will add to the 5,000 homes already within its leased residential portfolio.